A large number of young people are destined by God for the priesthood or the religious state. This is a vocation in its highest degree. Hence, although in a wide sense a vocation is required for every kind of life, when we speak of vocation we usually mean the call to the priestly or religious life. This being the highest of all calls, it is consequently the most distinct, emphatic and pronounced. Of this vocation our Lord spoke solemnly in his farewell address the night before He died, when He said: “You have not chosen Me: but I have chosen you; and have appointed you, that you should go and should bring forth fruit; and your fruit should remain” (John, 15, 16). With reference to the other callings in contrast with the priestly or religious vocation the words of our Savior come to mind: “Many are called, but few chosen”. (Matthew, 20, 16). A king may love and smile upon the multitude of the subjects and favor them variously: but only a few chosen ones He invites into the inner apartments of His palace to make them His intimates and confidants. God calls His own when He pleases. Our Lord chooses some the first hour, others the third or sixth, others again the 11th hour; in other words some receive the divine call to His special service early in childhood, others in youth and adolescence, others finally in manhood or womanhood. 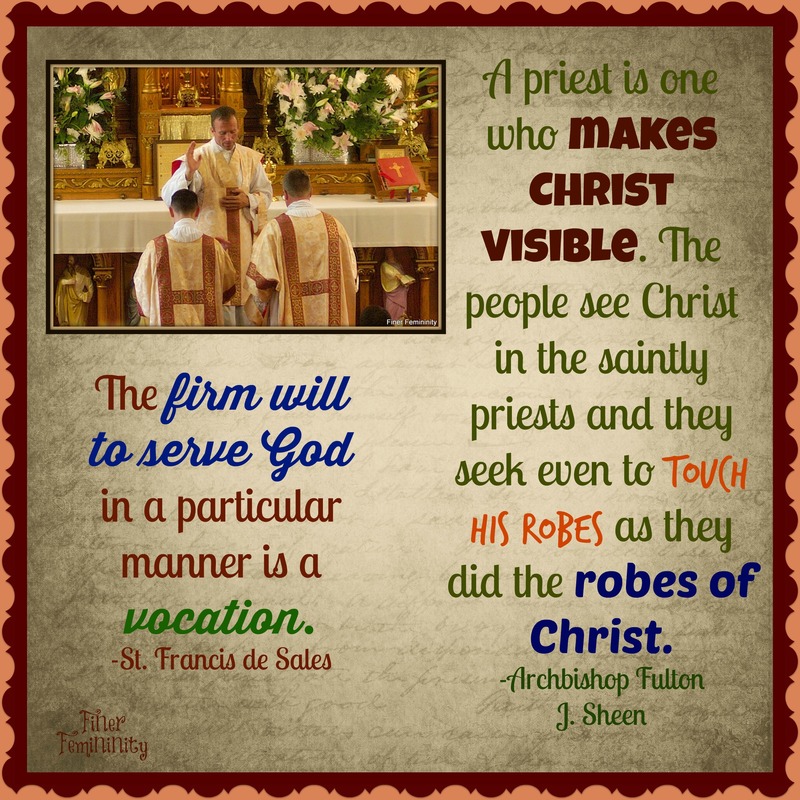 But whenever and however the vocation is received, to be among the chosen few of the Lord is of itself a great privilege, a high distinction and an enviable honor. At the same time this choice engenders proportionate obligations, sublime duties and heavy responsibilities in the chosen one. Many young men are called by God to be priests, He invites them into his sanctuary, into the Holy of Holies, to be His own ministers, the dispensers of His sacred mysteries, the mediators between Himself and man, His ambassadors, representatives, delegates and plenipotentiaries. What dignity could be higher? What power greater, what honor loftier? The young man who senses that he is called to the priesthood, therefore, crushed as he may be by the consciousness of his personal sinfulness and unworthiness, will gratefully appreciate and cheerfully accept the call from on high, trusting that God who calls him will equip and strengthen him sufficiently to meet the call and whatever it may demand of him. “God is faithful: by whom you are called unto the fellowship of His Son, Jesus Christ our Lord.” (1 Corinthians, 1,9). The more unworthy, unfit and unavailing a young man, in the spirit of true humility, considers himself personally to be, the better, worthier and more efficient a priest God will likely make of him. Here the words of our Lord are verified: “So shall the last be first and the first last”. (Matthew, 20, 16); in the words of St. Paul: “For see your vocation, brethren, that there are not many wise according to the flesh, not many mighty, not many noble: but the foolish things of the world hath God chosen, that He may confound the wise: and the weak things of the world hath God chosen, that He may confound the strong; and the base things of the world and the things that are contemptible hath God chosen and things that are not, that He might bring to naught things that are: that no flesh should glory in His sight. But of Him are you in Christ Jesus, who of God is made unto us wisdom and justice and sanctification and redemption; that, as it is written: he that glorieth may Glory in the Lord.” (1 Corinthians: 1, 26). Everyone who has a genuine call to the priesthood is at first overwhelmed by the thought of his personal unworthiness and unfitness, and is inclined to say with Moses, when he was called by God to act in His name: Who am I that I should go to Pharaoh, I should bring forth the children of Israel out of Egypt?” (Exodus: 3, 11). This sentiment of true humility is the best recommendation of the candidate. God will answer him as he answered Moses, saying: “I will be with thee.” This assurance suffices every aspirant to the priesthood even as it carried Moses through all the difficulties of his Divine commission. Although they have no vocation to the priesthood, many of our Catholic young men are called to the religious life to become monks, friars or brothers, and devote themselves to monastic or conventual occupations, or to works of Christian education or charity. There is a great dearth of postulants for these various phases of religious life. 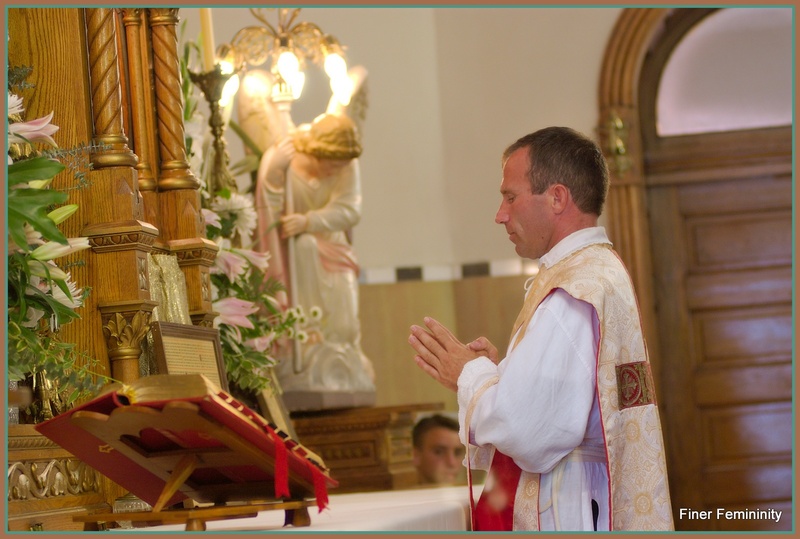 Whilst this vocation is not so sacred and divine as is that of the holy priesthood it is yet a very noble and sublime calling, offering every opportunity for the highest service of God, the attainment of heroic personal sanctity, and for participation in the saving of many immortal souls. They who follow it, whilst they have not the honor, also have not the tremendous responsibility, of the priesthood, and in their humbler sphere they easier achieve complete piece of mind, joy of heart and contentment of soul. If our Catholic young men, who are aiming to lead a virtuous celibate life in the world, understood how much spiritual comfort, strength and consolation they would derive from the monastic or conventual life, by consecrating themselves to it in lowliness of mind and uprightness of heart, our monasteries and convents for brothers would not have to be clamoring for candidates to do the work of God and religion they are most eager to do, much of which must be left undone because of the lack of laborers. There are a number of young men who are gifted and called to do this work – for this vocation has room for every kind of talent or aptitude, whether this talent have for its object mental, clerical, mechanical or ordinary labor – but who shun it from mere to timidity or vacillation in following the call that God gives them. They belong to the class of those to whom the Master of the Vineyard says, unavailingly, alas: “Why stand you here all the day idle?” (Matthew, 20, 6). They are practically idle; for in their irresoluteness they while away in aimless wishes and purposeless dreams, much precious time, which could be profitably and very meritoriously spent in the vineyard of the Lord for the salvation of souls. They cannot answer in sincerity: “Because no man hath hired us.” (ib., 7). There are ever so many convents, friaries and monasteries willing to hire them at once and forever. They announce it in books and magazines and newspapers that they are ready and eager to hire as many as come in candor and truth to do the work of the Lord and give themselves unreservedly to his service. What has just been said applies with equal, nay, with greater force to the vocation of religious brothers who devote themselves to teaching our Catholic boys and young men. Their number does not begin to meet the demand for them in our country. The church in the United States needs more of them from day to day. God gives the call, no doubt, to a sufficient number of young men; but unfortunately only few are seen to answer it. He made good his word by becoming a monk also, and vying with his brothers in the pursuit of sanctity. It were very good for the church, for themselves and the welfare of souls in general, if our Catholic young celibates in the world develop more of the same rivalry towards taking the kingdom of heaven by violence, and allowed themselves to be spurred on by the many youths, who annually enter the priesthood or the cloisteral life, to take the same generous step in answer to the call many of them are now leaving unheeded.